Bowden's declaration was submitted in an addendum to a brief filed by 22 state attorneys general, the District of Columbia, Santa Clara County, Santa Clara County Central Fire Protection District, and the California Public Utilities Commission. The government agencies are seeking to overturn the recent repeal of net neutrality rules in a lawsuit they filed against the Federal Communications Commission in the US Court of Appeals for the District of Columbia Circuit. Santa Clara Fire paid Verizon for "unlimited" data but suffered from heavy throttling until the department paid Verizon more, according to Bowden's declaration and emails between the fire department and Verizon that were submitted as evidence. The throttling recently affected "OES 5262," a fire department vehicle that is "deployed to large incidents as a command and control resource" and is used to "track, organize, and prioritize routing of resources from around the state and country to the sites where they are most needed," Bowden wrote. "OES 5262 also coordinates all local government resources deployed to the Mendocino Complex Fire," an ongoing wildfire that is the largest in California's history, Bowden wrote. The vehicle has a device that uses a Verizon SIM card for Internet access. Because the throttling continued until the department was able to upgrade its subscription, "County Fire personnel were forced to use other agencies' Internet Service Providers and their own personal devices to provide the necessary connectivity and data transfer capability required by OES 5262," Bowden wrote. 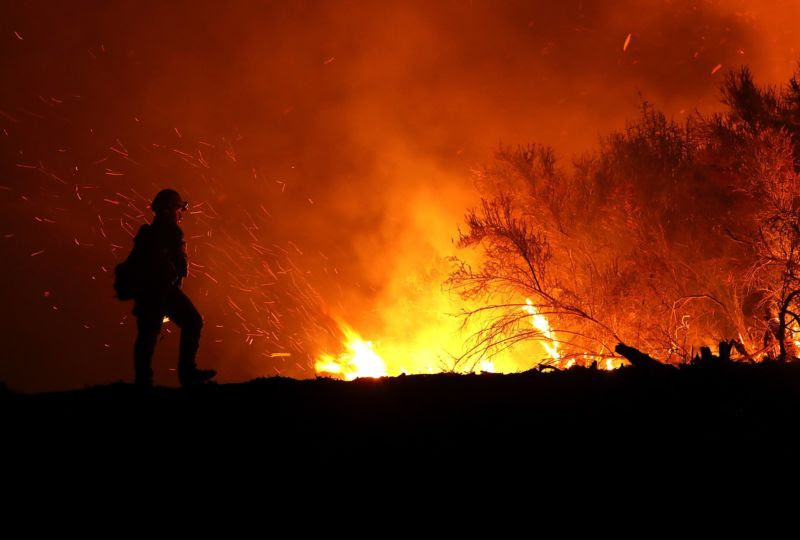 "In light of our experience, County Fire believes it is likely that Verizon will continue to use the exigent nature of public safety emergencies and catastrophic events to coerce public agencies into higher-cost plans, ultimately paying significantly more for mission-critical service—even if that means risking harm to public safety during negotiations," Bowden wrote. UPDATE: In a statement to Ars three hours after this article was published, Verizon acknowledged that it shouldn't have continued throttling the fire department's data service after the department asked Verizon to lift the throttling restrictions. Verizon also noted that the fire department purchased a data service plan that is slowed down after a data usage threshold is reached. But Verizon said it "made a mistake" in communicating with the department about the terms of the plan. Verizon also said that the Santa Clara "situation has nothing to do with net neutrality or the current proceeding in court." Verizon's throttling was described in fire department emails beginning June 29 of this year, just weeks after the FCC's repeal of net neutrality rules took effect. Even when net neutrality rules were in place, all major carriers imposed some form of throttling on unlimited plans when customers used more than a certain amount of data. They argued that it was allowed under the rules' exception for "reasonable network management." But while such throttling is generally applied only during times of network congestion, the Santa Clara Fire Department says it was throttled at all times once the device in question went over a 25GB monthly threshold. Even if Verizon's throttling didn't technically violate the no-throttling rule, Santa Clara could have complained to the FCC under the now-removed net neutrality system, which allowed Internet users to file complaints about any unjust or unreasonable prices and practices. FCC Chairman Ajit Pai's decision to deregulate the broadband industry eliminated that complaint option and also limited consumers' rights to sue Internet providers over unjust or unreasonable behavior. On June 29, Fire Captain Justin Stockman wrote an email to Verizon, noting that download speeds for an essential device used during large disasters had been throttled from 50Mbps to about 30kbps. A Verizon government accounts manager named Silas Buss responded, saying that the fire department would have to move from a $37.99 plan to a $39.99 plan "to get the data speeds restored on this device." Later, Buss suggested that the department switch to a plan that cost at least $99.99 a month. Verizon is currently throttling OES 5262 so severely that it's hampering operations for the assigned crew. This is not the first time we have had this issue. In December of 2017 while deployed to the Prado Mobilization Center supporting a series of large wildfires, we had the same device with the same SIM card also throttled. I was able to work through [Fire Department IT executive] Eric Prosser at the time to have service to the device restored, and Eric communicated that Verizon had properly re-categorized the device as truly "unlimited". Prziborowski expressed concern about the throttling in an email to Buss. "Before I give you my approval to do the $2.00 a month upgrade, the bigger question is why our public safety data usage is getting throttled down?" Prziborowski wrote. "Our understanding from Eric Prosser, our former Information Technology Officer, was that he had received approval from Verizon that public safety should never be gated down because of our critical infrastructure need for these devices." While fire department personnel thought they were already paying for "truly" unlimited data, Verizon said they weren't. "The short of it is, public safety customers have access to plans that do not have data throughput limitations," Buss told Prziborowski. "However, the current plan set for all of SCCFD's lines does have data throttling limitations. We will need to talk about making some plan changes to all lines or a selection of lines to address the data throttling limitation of the current plan." The emails started up again on July 5 and 6. "Can confirm that after using 25GB of data, our service drops to zero. This is unacceptable and needs to be fixed," fire department IT officer Daniel Farrelly wrote. Buss clarified that "data throughput is limited to 200Kbps or 600Kbps" after 25GB of use. Buss also told fire officials that all Verizon plans have some sort of throttling and that the department would have to pay by the gigabyte to avoid throttling entirely. Verizon has always reserved the right to limit data throughput on unlimited plans. All unlimited data plans offered by Verizon have some sort of data throttling built-in, including the $39.99 plan. Verizon does offer plans with no data throughput limitations; these plans require that the customer pay by the GB for use beyond a certain set allotment. OES 5262 is deployed again, now to the Mendocino Complex, and is still experiencing the same throttling. As I understood it from our previous exchange regarding this device, the billing cycle was set to end July 23, which should have alleviated the throttling. In a side-by-side comparison, a crew member's personal phone using Verizon was seeing speeds of 20Mbps/7Mbps. The department Verizon device is experiencing speeds of 0.2Mbps/0.6Mbps, meaning it has no meaningful functionality. Farrelly wrote a brief email to Buss that night, telling him to "Remove any data throttling on OES5262 effective immediately." Farrelly emailed Buss again the next morning, saying, "Please work with us. All we need is a plan that does not offer throttling or caps of any kind." Buss responded that afternoon, suggesting a plan that costs $99.99 for the first 20GB and $8 per gigabyte thereafter. "To get the plan changed immediately, I would suggest calling in the plan change to our customer service team," Buss wrote. That was the last email submitted in the court exhibit. Santa Clara apparently switched to the $99.99 plan, more than doubling its bill. "While Verizon ultimately did lift the throttling, it was only after County Fire subscribed to a new, more expensive plan," Bowden wrote in his declaration.